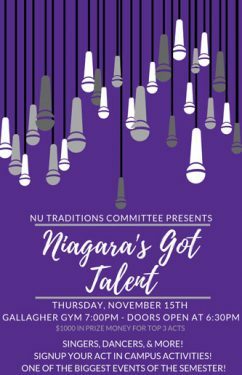 All members of the NU community are invited to attend Niagara’s Got Talent (NGT) on Thursday, November 15th at 7:00pm in the Gallagher Center gym. NGT is a wonderful event that showcases many students talents including singing, dancing, poetry, comedy, and more! $1000 in prize money is awarded to the top three acts! NGT is sponsored by the NU Traditions committee. Any questions please contact Bill Newton, Assistant Director of Campus Activities at wjn@niagara.edu.